NIAGARA FALLS, Ont. - A plan that could see the American side of Niagara Falls go dry for a short period of time to rebuild two bridges might be a boon to Canadian tourism. New York State Parks has put forth three proposals to replace two bridges to Goat Island - and two of those proposals recommend stopping the flow of water for five to nine months. New York State Parks spokesman Randy Simons says the proposal they are recommending would leave the falls dry from September to April, but it wouldn't happen until 2019 at the earliest and they still need funding. Niagara Parks Commission chair Janice Thomson says the dry rock wall would attract tourists like a nearly frozen falls did two years ago. Both Thomson and Simons say the project will have little effect on the environment and a nesting pair of falcons that live on the gorge will be fine. Ontario Power Generation, which helps control the flow of water over the falls along with its American counterparts, says it won't result in more power for Canada because the turbines are upriver of the falls. Simons called the dry falls "a once-in-a-lifetime" event "because beyond fixing these bridges, there is no reason to dewater the falls." A 131-page report on the designs, along with a drawings was presented to the public Wednesday night in Niagara Falls, N.Y.
"The meeting went great," Simons said. "People love the idea to fix the bridges - there was no real opposition." The bridges to Goat Island were built in 1901 and needed extensive repairs in 2004, Simons said, but the plan was to find a permanent fix. The proposal the park is recommending involves concrete archways that mimic the original bridges. Engineers would dry the falls for construction by installing a temporary dam - called a cofferdam - just upstream of the island. 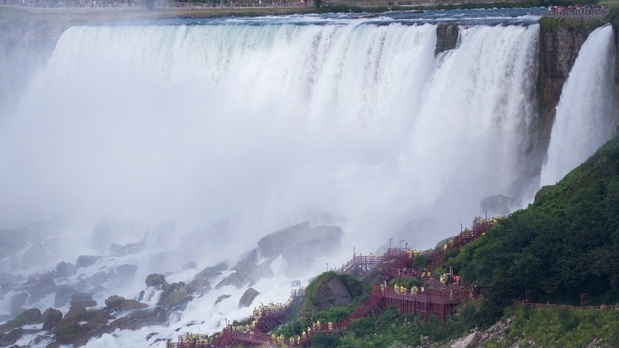 The water would then be funnelled down the Horseshoe Falls on the Canadian side. The drying process would be similar to the situation in 1969 when U.S. Army Corps of Engineers shut off flow on the American side to examine the stability of the area. Both Thomson and Simons say that thousands of tourists came out to check out the dry falls then, too.